This entry was posted on Sunday, November 18th, 2018 by Frances Ryan. I took part in a fun, blood-themed scavenger hunt yesterday. 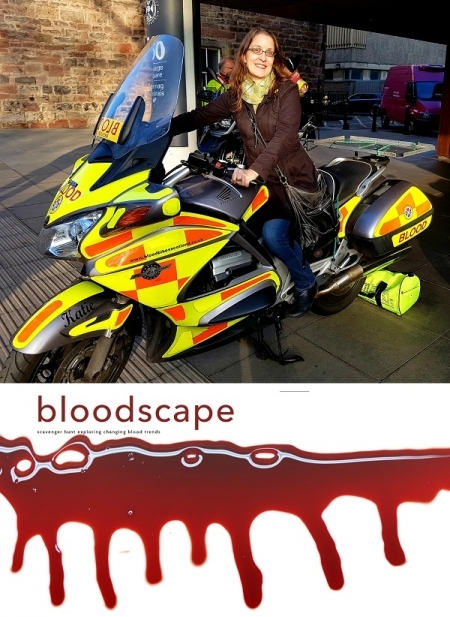 The event, Bloodscape, was designed to explore changing blood trends as part of the 2018 Being Human Festival. As someone who has a rare blood disease, and who loves geeky learning adventures, I was thrilled to be able to participate! The self-guided adventure was designed to showcase Edinburgh through the lens of blood—including changing trends, global campaigns and, of course, Harry Potter. The event was imaged around research conducted at the University of Edinburgh in Medical Anthropology, including how blood donation is used as a tool of social integration by immigrants and how climate change might disrupt blood delivery. A special shout-out to the event organisers, Stephanie Sodero, Morteza Hashemi, and John Moriarty. And to their partners, Blood Bikes Scotland, the Edinburgh Blood Donor Centre, the Imam Hussain Blood Donation Campaign (Scotland), the University of Edinburgh Centre for Medical Anthropology, the Institute for Advanced Studies in the Humanities, and the Being Human Festival. Bloodscape shed light on these bloody issues through a series of nine stops on the scavenger hunt trail, as described below. Stage 1: Blood Bikes Scotland: This was the first stop on the adventure. I had not heard of them before, but I now know that they are a volunteer organisation providing a free out-of-hours courier service for the NHS Lothian and Borders. After chatting with some of the volunteers, I learned that there are nine motorcycles in the BBS fleet, all operated by volunteers who sign up for shifts outside of their normal “day jobs”. The volunteers deliver small, urgent medical items such as blood samples, donor baby milk, equipment, and medication. And like most volunteer organisations, they can always use more passionate people to join the cause. If you’re interested in learning more about riding, helping with the phones and admin, or fundraising, I am sure they’d love to hear from you. You can learn more about their good work (and donate to the cause) here. Stage 2: The impact of global mobilities on blood supplies: This stop was an information point outside of a travel clinic that offers blood testing. Here, adventurers were reminded that travel provides great opportunities for cultural exchange—but those opportunities come with potential risks. These risks include infection carried by insects, such as malaria, West Nile virus, and Zika virus. What does that mean for the blood supply? Simple: It means that donors need to be aware of the risk of passing on infections after travelling abroad. The remedy is fairly simple, too: Donors should disclose any international travel prior to giving blood. Those who’ve travelled to at-risk locations will be given a blood test prior to donation, and/or may have to abstain from donating for a period of time. But don’t worry, the clever people at the blood donation centres will be able to help determine your eligibility to donate. Stage 3: A barbershop pole: Ah, yes. The infamous barber-surgeon from the days of yore. We all know the story, right? In the olden days (1700s and earlier) barbers performed minor surgical procedures. They did a bit of dental work, sorted out broken limbs, and a bit of bloodletting. (Sometimes, they’d cut hair and do some shaving, too.) The pole is a visual representation of the role of a barber during these times. Back then, the pole had brass wash basins at the top and bottom (the top representing where the leeches were kept, the bottom representing the basin that received the blood). The pole itself is meant to represent the staff that the patients would grip during bloodletting procedures to encourage blood flow. Thankfully, there are some great campaigners out there helping to address the need for minority blood donors. Here in the UK, that includes the Imam Hussain Blood Donation Campaign (IHBDC). They are working to spread the message of Imam Hussain’s sacrifice, which (to oversimplify their cause) is to save the lives of those in need through blood donation. The organisation was launched in January 2006 in Manchester and is now the largest Muslim Blood Donation Project in the UK—with a growing interest in the campaign from around the world. You can learn more about their important work here. I was very excited to talk with the volunteers yesterday, and I am even more excited about their worthy cause. As a woman of faith, whose life has been saved through blood donation, it was heart-warming to hear how faith was leading their cause. Talking with these lovely volunteers, who were so passionate about their cause, humbled me! Stage 5: Harry Potter (because, Edinburgh! ): You can’t have a scavenger hunt in Edinburgh without a Harry Potter link! The connection the Bloodscape team made here is that Mr Potter was of both magical and non-magical heritage, making him a “mudblood” (a highly discriminatory slur). Our language is filled with terms that relate to the “mixing” of blood, and history is replete with instances of strife caused by ideas related to “bad blood”. Although, mixing blood isn’t always viewed as bad. After all, there are rituals around the globe related to people intentionally mixing some of their blood to create the sacred bond of “blood sisters” or “blood brothers”. That is the message I am taking away from this stop: Blood binds us together as a society. Stage 6: Synthetic blood: This stage of the scavenger hunt brought me to a door just outside of Edinburgh’s Anatomical Museum, which houses a note that is written in the blood of serial-murderer William Burke. Here, an information point told of researchers who are investigating blood alternatives, or “synthetic” blood. Researchers at the Centre for Regenerative Medicine are working with researchers from academic communities, blood transfusion services, and the private sector to develop blood for the human blood supply chain from stem cells. You can learn more about the Centre’s research here. Stage 7: Laparoscopy: Commonly known as “keyhole” surgery, laparoscopy has changed not only the way in which many surgical procedures are done but also the amount of blood used in the operating theatres. This innovative medical technique uses fibre-optic instruments, accessing the surgical site through small “keyhole” incisions. The smaller incisions means a decreased risk of infection, shorter hospital stays, less pain, less scarring, and (importantly!) less bleeding. And less bleeding means a decrease in the demand for blood transfusions during surgery. In fact, there has been a 20% decrease in the demand for blood in Scotland over the past decade—in large part due to laparoscopy. Another laparoscopy fun fact: My splenectomy, which was performed because of my rare bleeding disease, was done laparoscopically more than 20 years ago. I spent two days in hospital and the scars are barely noticeable at all. Stage 8: The impact of climate change on blood supplies: Something I never really thought about before was the impact of climate change on blood supplies. But the moment I saw the sign my brain plugged in. Of course, climate change impacts the blood supplies: Climate change impacts everything. The immediate impact can be seen in short-term interruptions to supplies. For example, during this past winter’s heavy snowstorms donors and staff were prevented from getting to the blood donation centre. And a few years ago, severe flooding near the largest blood manufacturing centre in the UK (and Europe) meant that a massive “blood evacuation” had to take place to rescue thousands of blood products. Stage 9: Blood donation centre: The final stop on the scavenger hunt was the blood donation centre at Lauriston Place. I love this place, because it is one of the places where the magic happens. What magic, you ask? The magic of giving life through giving blood. If you have never given blood before, it’s not too late to start. It is a relatively painless process, but it can literally save someone’s life. Like mine! My next blood-related adventure takes place in a few days’ time. That’s when I will be back at the haematology clinic for a follow-up from this most recent platelet crash. I am feeling quite confident that I will be well on the way to “fixed” and that I shouldn’t require any further treatment (although I expect there will be at least some level of monitoring, as always). Thank you again to the event team. You did an amazing job. Bloody good on ya! Couldn’t resist. Ok well, I could have, but no.